Posted 1903. 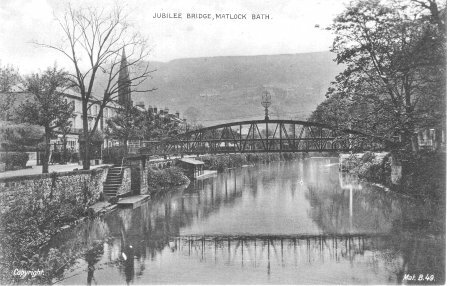 Jubilee Bridge, Matlock Bath. 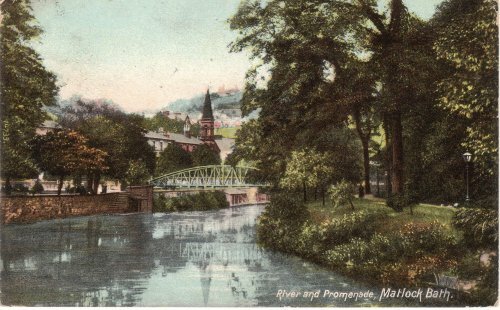 A cleaner climbs a ladder against a gas light, people sit under a tree next to a sign reading "boats", a fountain plays in the foreground. This bridge was opened in 1887, which was Queen Victoria's Jubilee year, when she had been on the throne for 50 years. 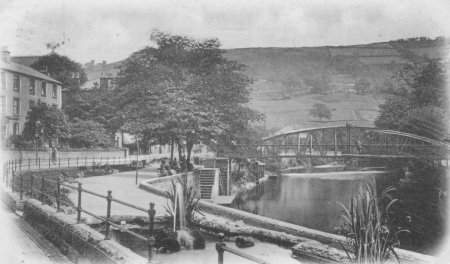 The Bridge leads to a delightful path called "Lover's Walk" along the East shore of the River Derwent. A detail from the 1903 photo. 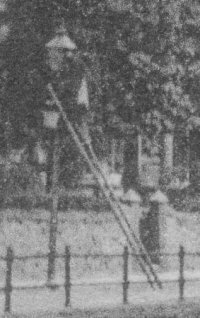 The man is cleaning the lantern of the gas street light with his ladder placed in the road, no anti-skids on the ladder, and no mate to help to secure the ladder foot. He carries a pail of water, a cloth hanging from his belt. He is crammed against the lantern, and is looking over his shoulder at the photographer. This looks like an accident waiting to happen! Today we would use a lorry carrying a cherry-picker, the man would wear a hard hat, would have a mate to help, and they would both be insured for millions of pounds. 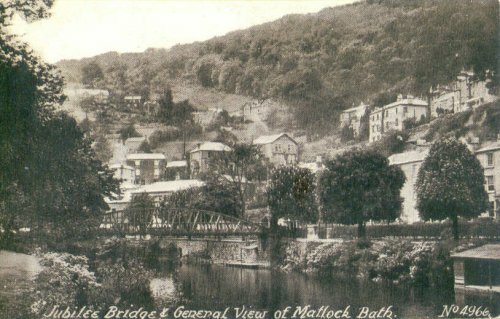 Traffic now roars along the A6 through the middle of Matlock Bath, and romantic gas-lights went out of use decades ago.